Riding motorcycles in the summer is 50/50 on most people’s enjoyment levels. One the one hand, it isn’t winter! That means we can actually lay some rubber down on the road. Also, the destinations are infinitely better. Backyard BBQs, baseball games, campfires, etc. However, when we get to those destinations, if we aren’t rocking the right gear, the downside is that we tend to be a sweaty mess. Such is the other side of the coin. With the Olympia Newport Pants riders are afforded a top-performing commuter motorcycle pant that has been specifically designed to keep them cool when the temperature rises. 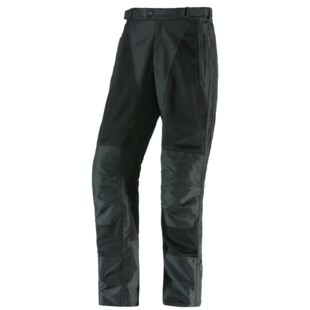 Constructed with a 600D EVO Thread outer shell, the Olympia Newport Pants are highly durable. At the same time, Olympia has incorporated large ballistic mesh panels throughout as a way to amp up the airflow. But not every day is a hot mess full of sunshine, totally true. For those rides the Olympia Newport Pants feature pull-on wind / waterproof AquaRes laminated rain pant to help them retain body heat / stay dry. Additional features include full side leg zippers, removable and adjustable CE-approved knee armor, and a relaxed tailored fit. With all of the riding that we want to do in summer constantly fighting against all of the sweating we don’t necessarily want to do, it is easy to see why some folks keep the bike in the garage a little more than would be ideal. Stay cool, stay protected, and stay on the road longer with the Olympia Newport Pants.